With PowerPoint 2010, you can generate presentations that combine text, graphics, charts, clipart and WordArt into magnificent visuals that hold your audience’s attention. To learn the fundamentals needed to make and modify basic presentations by using Microsoft Office PowerPoint 2010, enroll in a PowerPoint class with PD Training. With this PowerPoint 2010 Introduction training course, you will explore the PowerPoint environment and create a presentation. Upon the completion of the course, you will be able to add, rearrange & delete slides, add, edit & format the texts on the slides, apply character & paragraph formatting, add & modify WordArt, create & format charts & diagrams and much more. This Microsoft PowerPoint 2010 Advanced training course can be delivered at your premises by one of our expert local or international trainers or live online using our HIVE technology. 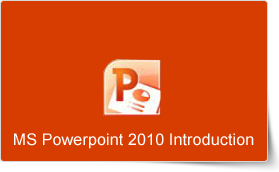 This PowerPoint 2010 Introduction training course running in Kuala Lumpur and Malaysia wide, is rated 5.0/5.0 in overall quality by ProCert Labs, covers the basic functions and features of PowerPoint 2010. After an introduction to PowerPoint's window components and Help system, participants will learn to create, save, and rearrange presentations. Then they will format text, use drawing objects, work with graphics, and insert tables and charts. They will then learn to use templates and themes, slide masters, and transition effects.